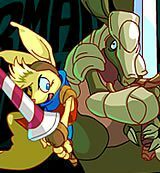 Armadillo Knight 3 - New adventure Milo and Gallan. "Hey, you're a Knight of Serenity right? Thank goodness you're here! You've got to help us!"